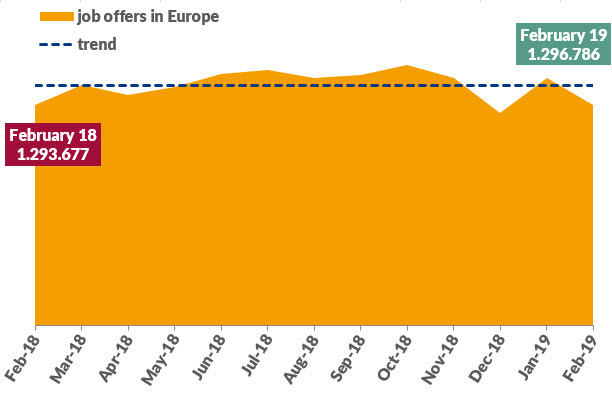 In February 2019 index Advertsdata could analyse 1,164,852 job offers* in the job markets of the newspapers and job boards in 9 European countries. This is an increase of 0,5 % compared to February 2018.
index Advertsdata analysed more than 17.1 million job adverts in Germany, Austria, Switzerland, Belgium, Luxembourg, the Netherlands, France, Denmark, Sweden and Norway from March 2018 till February 2019. Handicrafts workers enjoy the highest demand in most of these European countries. For instance, in Belgium, France, the Netherlands and also in the EU in total are craftspeople the most wanted occupational group. 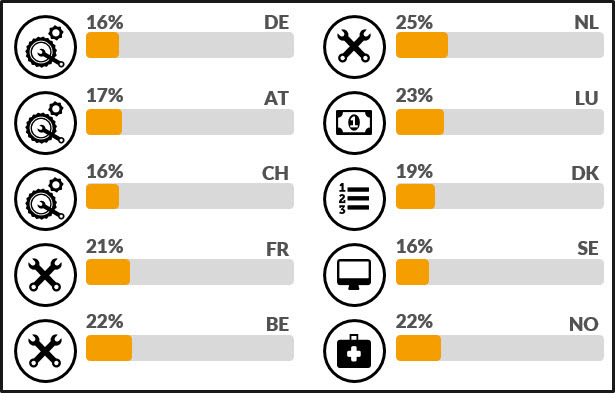 Germany, Austria and Switzerland have the most vacancies for technical professionals. In Luxembourg, financial experts are the most sought-after staff. index Advertsdata evaluated 496 print and online media in Germany, Austria, Switzerland, Belgium, Luxembourg, the Netherlands, France, Denmark, Sweden and Norway from the last 13 months. About 18 million job advertisements were posted from February 2018 till February 2019 in these media. The annual high with about 1,531,970 job positions was in October followed by July 1,500,989. The fewest employees were wanted in december. Only 1,245,101 jobs were offered during this period. Despite the decline of job offers in a few months the overall demand is stable. Monthly up-to-date information on the job market! We regularly provide you with information on all aspects of the job market and show job market trends as well as current job market developments. Benefit from our job market research and discover everything about the job market.